The mobile consumer wants easy access to everything! ApolloBravo creates mobile promotions that are easy to access via QR codes, text messaging, and location-based marketing. 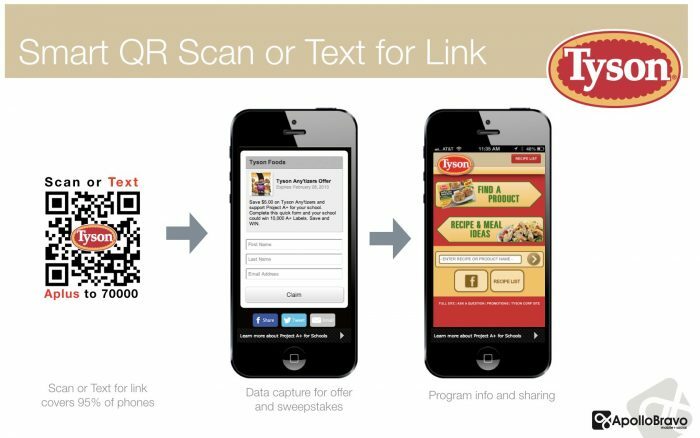 Using QR codes and text shortcodes linked to mobile responsive websites, Tyson Foods customers easily interacted with product information, special offers, and programs, like A+ for schools. Codes can be added to advertising, packaging, and POP materials. We design programs that not only encourage customer interaction but also are the first step in building quality customer communication.